Designed for you Sugar provides an easy-to-use Customer Relationship Management (CRM) interface focused on features that matter and nothing more. 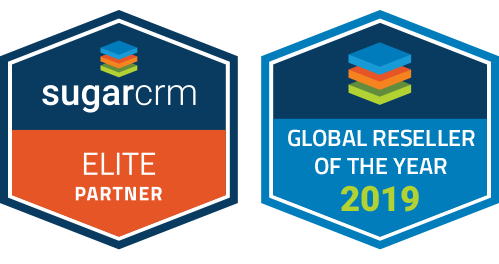 As a Top 5 Worldwide and Elite designated SugarCRM partner we have deployed Sugar to 100's of organizations. We are business analysts and developers, and we want to make Sugar fit your organization like a glove. Put us to the test, we love a challenge. We publish a wealth of tips, customization examples, and reviews of useful tools that work with Sugar. To learn more visit our blog. Sugar 8.3 was released on January 14th 2019. This video will give you an overview of the new features and functionality available in this release. Sugar 8.2 was released on October 9th, 2018. These resources will give you an overview and detailed information about what's new in this release. This course will provide you with the introductory skills necessary for administering Sugar. Get started and equipped with lessons learned from Sugar Solution Architects as they share the platform knowledge and skills required to implement Sugar to meet customer requirements. Get started as a Sugar Developer and learn how to implement Sugar platform customization requests through a variety of extension techniques and best practices. This course will get you started with the Sugar platform, you'll learn about how to get started with Sugar, the most commonly used modules, and how to how to navigate the application. Learn the essentials of using Sugar as a Sugar business user. You'll learn how to navigate the application, create records, convert leads, create reports, forecast, and much more. A look at wBenchmark, our Sugar add-on that enables you to capture periodic snapshots values of key performance metrics. Got questions about Sugar? Get a free demo of Sugar and discover a different kind of CRM.